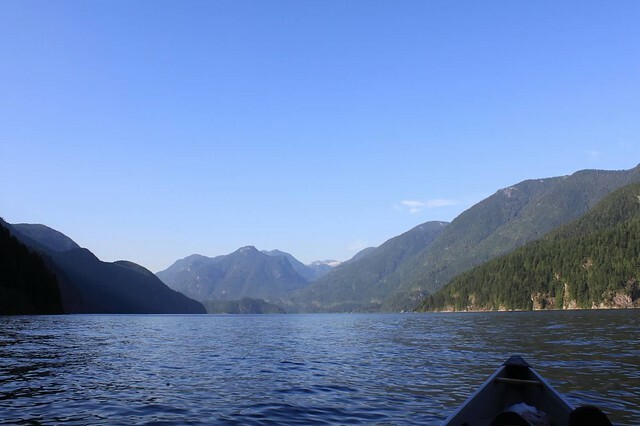 I've lived in Vancouver for a long time now, but until last weekend haven't gone up Indian Arm. Even though we live in Deep Cove, minutes from where this trip starts and finishes. So last weekend some friends and I took our canoes and kayaks up the Arm. It started on Friday in glorious weather with a paddle up to Bishop Creek campground. It only took 2.5 hours as it turned out, although we left lots of time. It's quite amazing that an hour or so paddle away from my house you can get to a steep walled, sparsely populated fjord. Saturday we headed up to the top of the arm, then around to Granite Falls and back to the campground. For both nights I slept out under the stars, in a sleeping bag, no tent, looking at the fabulous stars. It was quite and glorious and a really relaxing trip. The only downside is that it is far too close to Vancouver and there seems to be an amazing amount of idiot power boat users. Some of them are loud, speeding around from 7am. Some park off shore, playing music incredibly loud and drinking. Others seem to ignore any rules. There's no end to human obnoxiousness and their ability to spoil nature.